This has been an unusual week with two airliner incidents which did not result in any injuries or damage, but which had the potential to become catastrophic plane crashes. On 19 October 2009, Delta Air Lines Flight 60, a 767 on a scheduled flight from Rio de Janeiro to Atlanta, GA, mistakenly landed on a taxiway at Atlanta Hartsfield Airport. The aircraft had been cleared to land on the 12,000-foot long runway 27R, but instead landed on the taxiway which is parallel to the runway. The FAA reported there were no other aircraft on the taxiway and the landing and rollout were normal. The runway lights for runway 27R were illuminated but the localizer and approach lights for 27R were not turned on. The taxiway was active but was clear of aircraft and ground vehicles at the time the aircraft landed. The wind was calm with 10 miles visibility. The landing occurred at about 6 am, a little over an hour and a half before sunrise. The NTSB is investigating this event, and it will likely generate extra scrutiny within the organization. Runway safety has been an area of great concern for the NTSB for many years, and has been one of their Most Wanted Transportation Safety Improvements since 1990. Among the recent runway related events that the NTSB has investigated was a September 2008 near collision of a regional jet and a small Cessna at Allentown, PA, and the fatal crash of a Comair regional jet in Lexington, KY in August 2006. On 21 October 2009, a Northwest Airlines Airbus A320, Flight 188 from San Diego, CA to Minneapolis/St. 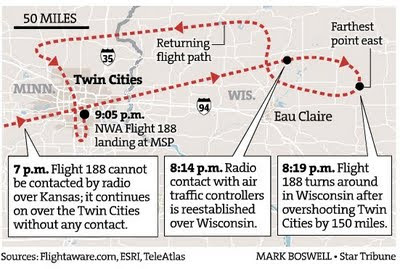 Paul, MN, with 147 passengers on board, stopped communicating with air traffic control while the aircraft was in cruise at 37,000 feet. Authorities were concerned that the flight was being hijacked and had military jets on standby at two locations to intercept the aircraft, though no aircraft were launched. About an hour after the crew stopped communicating, the aircraft flew over the destination airport and continued northeast for approximately 150 miles. Air traffic control then reestablished communications with the crew and requested that the flight proceed to Minneapolis. The aircraft was out of radio contact for about 75 minutes. The crew landed the aircraft without further incident. According to the Federal Aviation Administration, the crew was interviewed by the FBI and airport police. The crew stated they were in a heated discussion over airline policy and they lost situational awareness. The Safety Board will interview with the crew and review the data on the flight data recorder and cockpit voice recorder. While the flight data recorder has the capacity to record all data from the flight, the cockpit voice recorder would have only recorded the last 30 minutes of the flight. The two pilots have been suspended from flying while Delta (which owns Northwest) conducts an internal investigation. This isn't the first time that an airliner has overflown its destination. On 13 February 2008, a Go! airlines jet on a flight from Honolulu, HI to Hilo, HI and with 40 passengers on board overflew Hilo by about 26 miles after both pilots fell asleep during cruise. After the crew woke up, the flight landed in Hilo without further incident. The investigation into this week's Northwest Airlines event is ongoing, and it may be months before that investigation ends and a cause is determined. However, the full report on the go! Airlines event is available below. Shortly after this article was published, a reader pointed out a number of glaring grammatical errors in the post. We regret those errors, and we hope that we have corrected them all. We thank that reader, and we welcome any and all comments, especially when you point out this site's shortcomings. Company dispatch could have "selcal" called the aircraft to give a wake up call. As in all unscheduled incidents, many more factors come to light during a full examination of all actions/failures to act are examined. That landing on a taxiway thing is interesting. During flight school I remember getting to land on a taxiway and a bridge. They built a random bridge to land on. I liked landing on the taxiway because it was shorter than the runway and it was a greater challenge.